Sister ship to Spirit of Discovery, Spirit of Adventure boasts the same heightened level of luxury and comfort onboard. 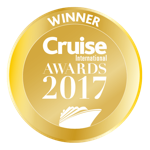 Fitted with 554, all-balcony cabins – 100 of which are for solo cruisers – each and every guest will be left feeling special, and thoroughly pampered and relaxed. Along with generous and stylish cabins, Spirit of Adventure delivers luxury in the form of a superb quality of service delivered by the crew, delectable onboard dining choices, and excellent entertainment opportunities. There are a number of brilliant choices when it comes to cuisine onboard Spirit of Adventure, whether you’re looking for a traditional cruise dining experience, with a range of a la carte dishes, or something more unique. The Dining Room – the main restaurant onboard serves an array of international cuisine, so there should be plenty on offer to suit all palettes. The Grill – another popular option is this more casual venue which offers inside and outside seating. Diners can expect freshly prepared meals of meat, fish, and vegetarian options. Khukari – this is the perfect place for those wanting a slightly different evening. It’s a homely, welcoming Nepalese restaurant serving a range of flavoursome dishes. Amalfi – those with a soft spot for decedent Italian food will rejoice in the list of hearty pizza, pasta, and meat dishes on offer at this friendly speciality restaurant. If you’re looking to be entertained with onboard activities and performances, The Britannia Lounge is the place for you – day or night. Or, the 420-seat Playhouse theatre also houses some excellent shows. On the other hand, if you’re simply looking to make some new friends and spend an evening socialising, there are several suitable venues. Try The Living Room, which has a full bar as well as coffee and snacks, the ship’s main bar, the North Cape Bar, The Supper Club, or the Observation Deck which has splendid views. As well as a fully-equipped gym, Spirit of Adventure also boasts an outdoor games area, with a sports court and deck games available. There is also a lovely spa onboard where you can treat yourself to a treatment, or simply spend time in the sauna, steam room, and hydrotherapy pool.